Keeping Students Accountable in Daily 5- Without Taking Away Student Choice! In my last post, I shared about my Daily 5 adaptation. Some teachers and I were recently talking about the idea of (structured) free choice. It’s something that the original Daily 5 book emphasizes and encourages, but I was surprised to find out that a lot of teachers aren’t comfortable giving up that control. To be fair, many of the teachers I talked with are in younger grades, which I think makes a huge difference… but I have loved giving my students free choice during the Daily 5 rounds! P.S.-- Aren't these circle signs perfect? I got them from Ladybug's Teacher Files, but I'm not sure she's still offering them anymore. Choice bolsters enthusiasm and gives students a sense of personal responsibility for their learning- but I was concerned about making sure the students were still reading. While I’m working with small groups and individuals during the rounds, my students are allowed choice each day, but not without accountability. How do I keep students accountable while giving them choice? My students should be doing Read to Self every day, and should be engaged in reading tasks throughout every reading round. I ask them to keep track of what they read in a reading log, which I check regularly when I confer with each student (usually once a week). Each week, students look at the Weekly Must Do board to find out their responsibilities. The tasks are also explained on Monday. Because I teach writer’s workshop separately, our “Work On Writing” choice really means “Writing About Reading” in their readers’ notebooks, so most of their Must Do’s are reading prompts. On an average week, my third graders did one guided response (to something I read aloud or we read together) and one free response (about something they were reading during a reading round). Some students “forget” to complete their reading journals, but I can usually motivate them by showing them (or their parents) what a zero or two do to their grade… or keeping them in from recess one day to finish them. I only had to do that once for one student- and she never “forgot” again! Sometimes the students also had a Must Do at the Word Work station, such as my Word Detective freebie or one of the activities I used to use as centers, if it fits with our current learning. Other than knowing that these tasks must be done by Friday, students get to choose Read to Self, Read to Someone, Listen to Reading, Word Work, or Write About Reading during each round. I do urge them to do Read to Self every day and try to get to each other choice twice during the week, but I get more lax later in the year as the kids get “into” reading! So what if my students CAN’T handle the choice? Take it away! I warned my students that choice was a privilege that could go away at any time. When there was an issue with a student not completing the “Must Do’s” for the week, I brought it up during our weekly one-on-one conference. Usually, by talking to them individually, I was able to help most develop some responsibility without a scheduled rotation. For a few, it was too much to handle and I ended up needing to give them a structured rotation, but it was very rare I had to do that. If the whole class wasn’t handling it well, you could try a rotation system. I used to handle my center rotations through a wheel like this, so I would probably use something similar with Read to Self on every third spot. So is it bad to take choice out of the Daily 5? I think choice really helps give students ownership of their learning but also allows them to develop a stronger love of reading. I had 2 students who spent every round for 3 days reading a book together and responding to it in writing because they were so into it- and if I’d limited their choices, that would have never been able to happen! But while choice has its benefits, it’s not right for every class or every kid. I don’t think it’s terrible if teachers decide it’s not working for their class- but I do suggest that every teacher try it. If you set up the Daily 5 procedures as the book suggests, you’ll be really surprised how well your kids handle the choices! Give them a chance- and if it doesn’t work, you can tweak it! That’s the beauty of the Daily 5. My kids LOVED having choice- and the threat of losing it was usually enough to motivate them to do it right! What about you? If you do the Daily 5, do you allow your students choice? Why or why not? Before I go, though, I have to share how much I am absolutely LOVING my new blog makeover by Kimberlee at Digital Doodle Designs! When I won her giveaway, I wasn’t sure exactly what I wanted, but she sent me options and helped me figure out the perfect idea- and created it within a couple of days! Kimberlee was so easy to work with, even when I was being picky! She clearly wanted me to LOVE every detail of the final design, and I couldn’t be happier with how it turned out! Everything on my blog is finally cohesive and professional, while still keeping the cute. I would HIGHLY recommend Kimberlee to anyone looking for a blog update- you won’t be disappointed! 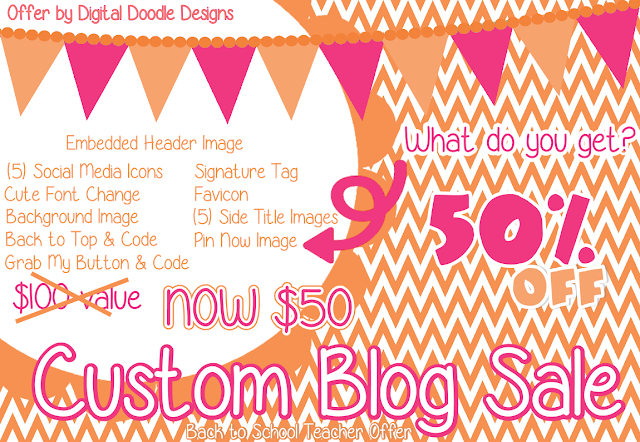 She’s even having a 50% off sale right now on her top level of blog designs! Check out Kimberlee’s incredible freebie blog and design blog, and tell her I sent you! Back to school, for me, has always been an exciting time of new beginnings- and new chances to be better organized! 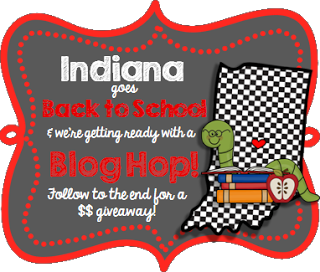 Read on to find out how I organize my 90 minute reading block, and to snag a data organization freebie as part of the Indiana Goes to School freebie hop! Indiana requires teachers to use a 90 minute, uninterrupted reading block every day. I organize my block by using an adapted version of the Daily 5 (which of course belongs to the Sisters, not me, and they have not endorsed this adaptation). Mini-Lesson 1: almost always a read-aloud to teach a skill, but this alternates between picture books, parts of our current chapter book, news articles, and non-fiction selections. Each week we are usually focused on one or two specific strategies, which we add to our CRAFT board (an adaptation of the CAFÉ program created by Kristen at Ladybug’s Teacher Files). Round 1: usually a small guided reading group. I don’t get to meet with every small group every day, but I generally meet with groups every other day or so. Mini-Lesson 2: my phonics/ phonemic awareness lesson, working with our spelling and reading pattern of the week to find examples and non-examples, or sometimes doing fluency practice (often including that pattern). Round 2: Another small group. Usually, these are homogeneous groups based on student level, but I keep in mind their skill needs and interests too, so occasionally the groups make more sense heterogeneous. My groups are very flexible! Mini-Lesson 3: always starts with quick vocabulary work. You can read more about my vocabulary routine here. From there, we usually spend some time digging into text together- either the weekly basal story or a common text, like our Time for Kids magazines. Round 3: This one is usually cut shorter because mini-lesson 3 almost always takes longer than 15 minutes- but that’s okay. Round 3 is usually when I pull students aside with their book box and reading notebook for 1-on-1 conferring and assessment. I like to use their numbers in my plans for anonymity but also space purposes! There’s no way my kids could do that! The Daily 5 doesn’t start on Day 1, or sometimes even in Month 1. Setting up the Daily 5 takes a lot of time and patience, but it’s possible! If you need information on how to get started, please please please go to the source and read the original books! Isn’t that a lot to fit in? ABSOLUTELY. But teaching in “mini-lesson” format with time blocks forces me to cut my lesson down to the most important parts, the short time frame helps my students pay attention the whole time, and what’s happening during the rounds is so important that it’s absolutely been worth it in my classroom. Does it happen every day? Heck no! This is the general schedule, but sometimes we do two rounds, one round, or even no round on a super busy day (but students do get upset when this happens)! Occasionally we fit in an extra reading round, which most of them LOVE! Is the Daily 5 even worth it? Running the Daily 5 has really simplified my reading preparation because I’m not creating and setting up new centers each week, but even better? My students aren’t just doing “reading activities”- they are really READING! If another teacher questions the program, ask them if their students are spending 45 minutes a day reading. My kids are. The Daily 5 has made them better readers because they are reading so much and I am getting so much time to differentiate instruction. I wouldn’t be able to do that, though, if I didn’t keep my data in my teacher binder. Both schools in which I’ve taught used DIBELS as a quick indicator, especially for reading fluency. It’s not near as useful as a student’s book level for comprehension, but DIBELS Next makes a great quick check and helps me formulate small groups- when the data is organized. To help you this year, I’ve created DIBELS Next Organization Charts for grades 2-6. The charts list the tests in order and the goal for each test to hopefully help you organize your data to guide your reading block, no matter how it’s set up! The best news? They’re FREE! 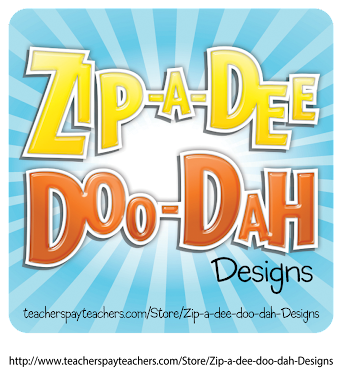 Visit my store here to see charts for 2nd grade, 3rd grade, 4th grade, 5th grade, and 6th grade. Each one includes a chart for BOY, MOY, and EOY with grade level goals listed for each test section. If you’re a new friend, make sure you check out some of my other freebies both on the blog and in my store before you click on the button below to head to Primary Inspired for the next freebie! (Did I mention there’s a $75 gift card giveaway at the end? I bet you ALL could use $75 to help with your back to school shopping (or help make up for it! :) Happy blog hopping! Throwback Thursday- 5 Quick Tips! Of course, it's now too late to link up, but you can still read other teachers' tips at Miss Kindergarten! Annnd special thanks to Cara at The First Grade Parade for hosting Throwback Thursday! So, the night before we picked up the moving truck, I decided to go for it- despite having a million other things I should have been doing with my time. There are also significant amounts of broken glass, because my husband has an amazingly bad track record with candles. I’m telling you. REALLY bad. 3) Get the candle wicks to stick to the bottom of the glass jar. I put three in each candle because I think it burns more evenly. They wouldn’t stand up well on their own, so being the teacher I am, I used a trusty glue stick. 4) Put a jar into the boiling water and let the wax melt. This took 15-25 minutes for the big jars. Be careful of the sludge at the bottom and the old wick, though! 6) When this layer is hardened enough that the wax will stay in layers, you can pour the next layer on top. For me, it worked well to alternate between making 2 candles to give each one a little more time to harden. Autumn Charm (Pumpkin Buttercream, Cinnamon, and Spiced Pumpkin), Baked Deliciousness (Christmas Cookie, Buttercream, and Vanilla Caramel), annnd Fabulously Fruity (Juicy Melon, Strawberry Shortcake, Orange Dreamsicle). They did get a little less layered looking and a little less smooth by the next morning. Still, I’m pretty happy with taking ten-ish candles that were nearly done for and getting 3 new candles that will last a long time (and smell great)! Upcycling for the win! It’s not perfect, but considering it was all hand-drawn, I think it turned out alright- and she really liked it! It was inspired by a Pin I saw, so if you’re interested in something similar, you may want to check out her Etsy store for a much better version! On a side note… where the heck is our summer going? Is it really mid-July already? Yikes! So, I technically stopped being an Indiana teacher blogger about 4 days before the meet-up… but these girls were gracious enough to let me join them anyway! The 15 of us met up at a Mexican restaurant and stayed for hours binging on chips and salsa (or was that just me?) and chatting about our schools, blogging, and TpT. It’s always great to get together with other teachers, but being bloggers too just gave us that much more in common. Our hosts Heather and Ciera made us personalized nametags (which made me feel *so* official) and these cute quote frames! Isn’t it cute? They even planned a teacher gift exchange! If you ever get the chance to go to a meet-up, make sure you do it. I had such a great time with these girls- totally worth 4 hours in the car!